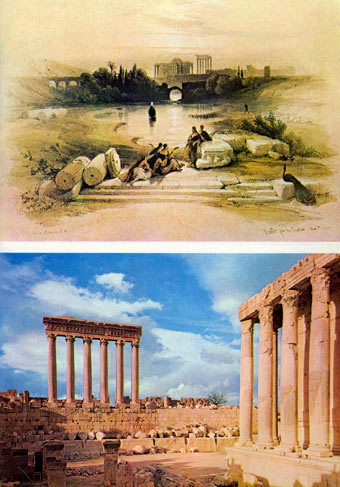 The upper picture shows a lithograph by David Roberts whose book The Holy Land appeared in 1842. Six out of the original fifty four huge 68 feet high columns, appear in the distance in the lithograph, and beyond the Temple of Bacchus on the right in the photograph. This is all that remains of the Temple of Jupiter Heliopolitanus built to honour the Great Lord (Baal) Hadad (Jupiter) on the vast platform, the history of which goes back into Caananite antiquity. The platform contructed of precision cut stones, three of which weigh in the region of 870 tons, measuring 270 feet by 180 feet by 30 feet high, was said to have been built by Cain to hide from the wrath of God.